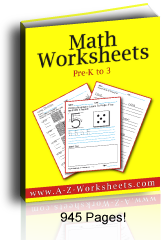 You'll like this easy page of Math words that start with D. Use it for playing Math games. It is one of 26 different pages of Math definitions gathered from at least half a dozen old Math books. This list is the most complete that we have found. Words that start with D: Degrees, Diagonal, Domain. 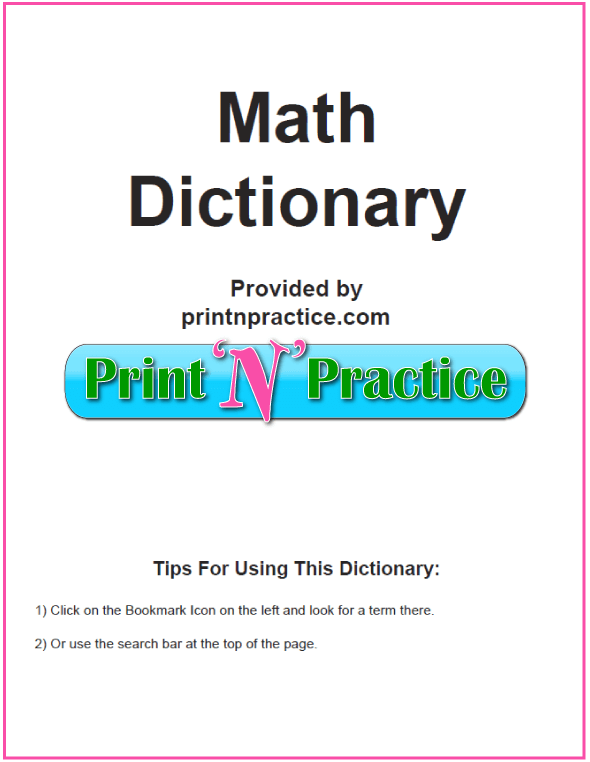 Print the Math Dictionary below. Data - facts that have been collected but not yet interpreted. Decagon - a ten sided polygon. Decameter - 10 meters (in the metric system). Deceleration - a slowing down of speed. Decimal Fraction - is a fraction whose denominator is 10, 100, 1000, etc. Decimal Number - a number written to the base 10. Decimal Places - places to the right of a decimal point. Decimal Point - the period in a decimal number separating the integer part from the fractional part. Decimal system - the system of numeration that uses decimal numbers. Deduction - act of taking away, subtraction; reasoning from the general to the particular, from given premises to their necessary conclusion. Deficient Number - a positive integer that is larger than the sum of its proper divisors. Degree - the degree of a term in one variable is the exponent of that variable (as in a degree of a polynomial), a unit of measure for agles. A right angle is a 90 degree angle and a straight angle is a 180 degree angle. Degree of an Angle - a special unit of measure that measures things that are circular. Degrees - a circle is measured in units called degrees. The entire circle is 360 degrees, half a circle is 180 degrees, and one quarter of a circle is 90 degrees. The “L” shaped 90 degree circle forms what is called a right angle. When examining circular objects, such as spinners, the size of each segment in the circle can be described in degrees. Denominator - the number below the fraction bar that indicates how many parts into which the whole is divided. Dependent equations - simultaneous equations whose solution sets are equal. The graphs of dependent equations are single lines. Dependent variable - when considering a function, the variable whose value depends on the value assigned to another variable called the independent variable. Where the function y = 4x + 6, y is the dependent variable. Diagonal - in a polygon, the line segment joining a vertex with another (non-adjacent) vertex is called a diagonal. Diameter - the longest chord of a figure. In a circle, a diameter is a chord that passes through the center of the circle. Difference - the answer you get when you subtract one number from another number, the remainder in subtraction. Differential Calculus - that part of calculus that deals with the operation of differentiation of functions. Digimetic - a cryptarithm in which digits represent other digits. Digit - In the decimal system, one of the numbers 0, 1, 2, 3, 4, 5, 6, 7, 8, 9. Dihedral Angle - the interior angle formed by two planes. Dimension - the indication of how far something extends in space; especially length, height, and width. Diophantine Equation - an equation that is to be solved in integers. Disc - a circle together with its interior. Discontinuous Graph - a line in a graph that is interrupted, or has breaks in it. Disjoint Events - events that can’t both happen at the same time. Disjunction - a statement of two conditions of which only one condition must be true in order for the statement to be true. Distributive Law - the formula a(x+y)=ax+ay. Distributive Property - summing two numbers and then multiplying by another number yields the same value as multiplying both values by the other value and then adding; a property of real numbers that notes that, for any real numbers a, b, and c, a(b + c) = ab + ac and (b + c)a = ba + ca. Dividend - in the expression “a divided by b”, a is the dividend and b is the divisor; the number you are dividing. The dividend is divided by the divisor to find the quotient. Division - a basic arithmetical operation determining how many times one quantity is contained within another, the inverse operation of multiplication. Division sign - A symbol indicating that one number is to be divided by another. Division is also indicated as a fraction, i.e., 21/7=3. Divisor - in the expression “a divided by b”, a is the dividend and b is the divisor; the number you are dividing by. The dividend is divided by the divisor to find the quotient. Dodecagon - a twelve sided polygon. Dodecahedron - 3 dimensional geometric figure (a polyhedron) that is made up of 12 regular pentagons. Domain - the domain of a function f(x) is the set of x values for which the function is defined. Domain of the Function F - the set of numbers x for which f(x) is defined. Domino - two congruent squares joined along an edge. Duodecimal Number System - the system of numeration with base 12. 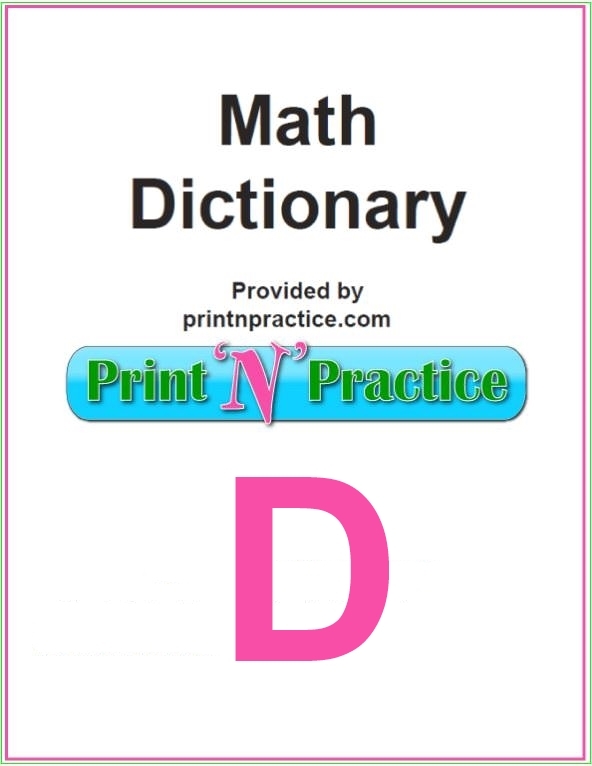 Division and it's denominators as well as metric numbers make up a good portion of the Math vocabulary for words that start with D.
The metric system has many measurements that can begin with the same prefix as with deci and deca. The easiest way to have children understand the differences is to show the difference (a D word!) in the size indicated by the prefix. Teaching the metric system is a great opportunity to teach how prefixes change the meanings of words and how the meanings can often be understood from the prefixes and roots in a word. 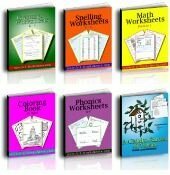 You can find many phonics words that start with d on our phonics worksheets here. Thank You for visiting our words that start with D!